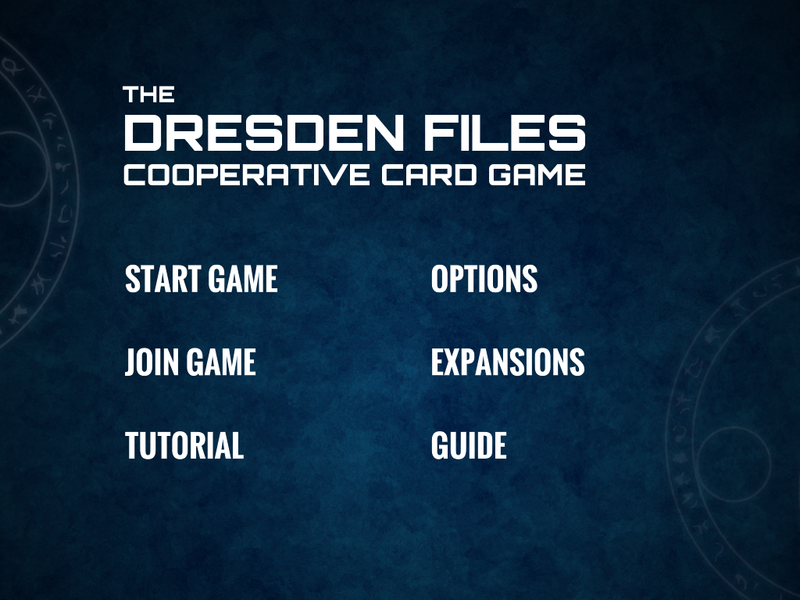 Here's my first pack of screenshots showing work-in-progress for DFCO. These are all 1024x768, so you can see what the game looks like at iPad aspect ratio. 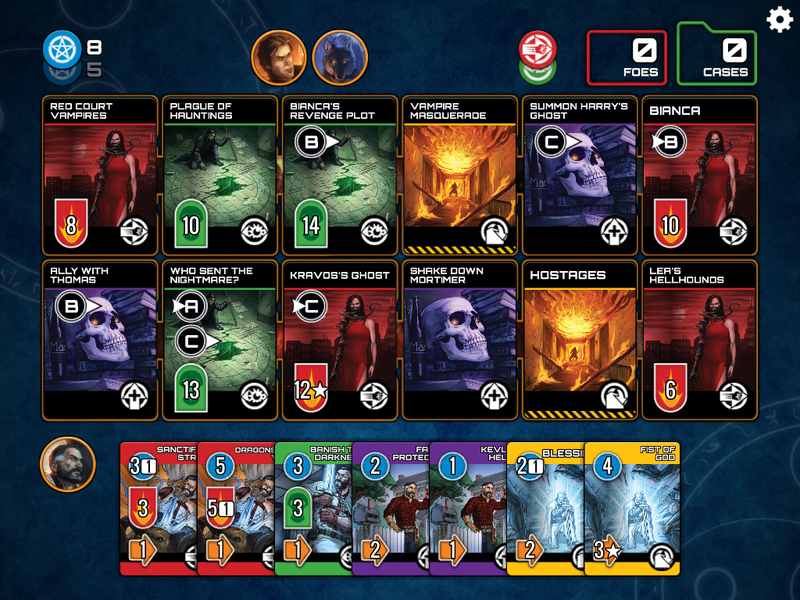 On a wider screen, the game uses the extra space to spread the player's hand out a bit more. This is not set-in-stone, yet. We may be reorganizing/redecorating later. 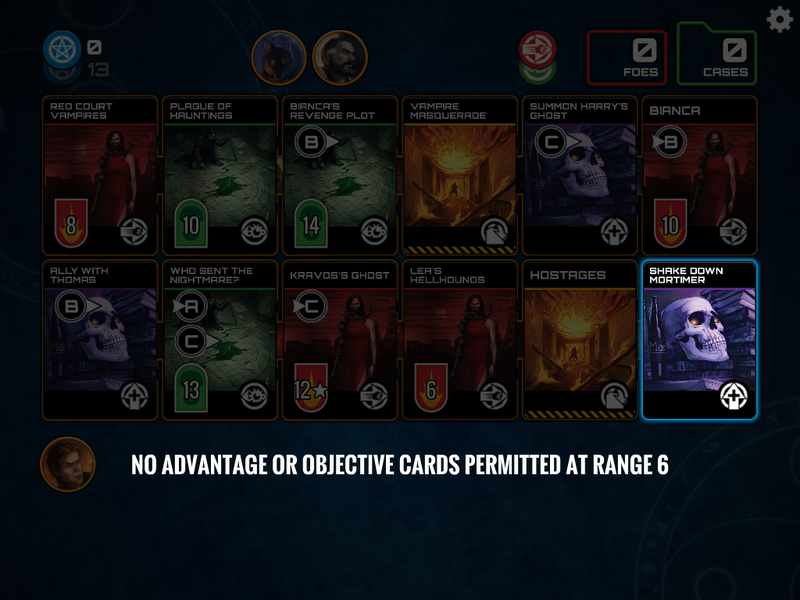 As you can see, we've got our compositing working for the detail cards. These are totally data-driven, so localization and/or rules corrections are possible, when necessary. This card shows has a lot of bits and bobs on it. I wanted these to be really close to the print versions of the cards. 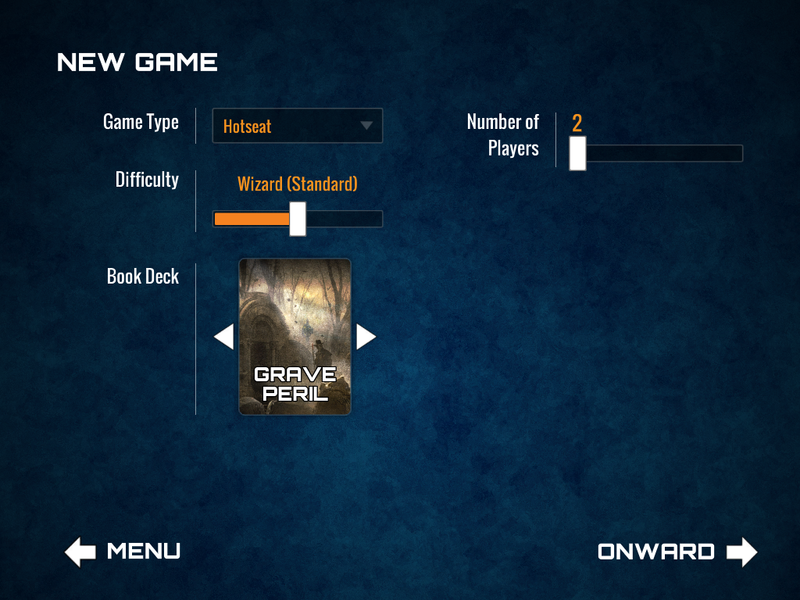 These New Game screens may end up with more options on them, later. 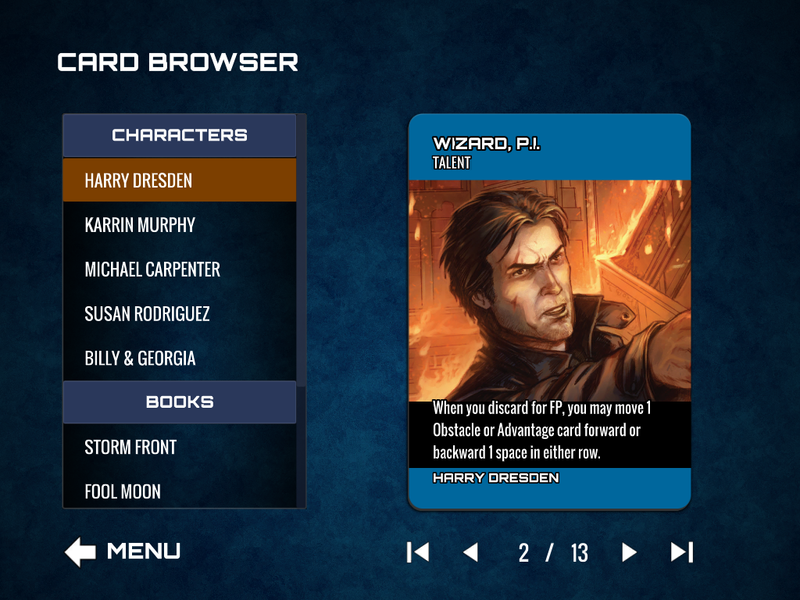 For a Solitaire game, you can pick which two characters go out with Harry (or leave them random). 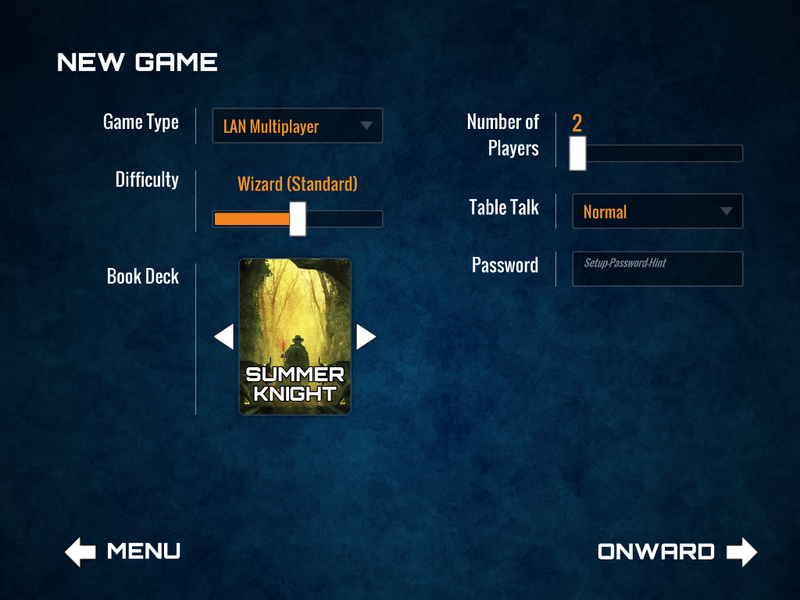 This game mode is for multiple people taking turns playing on the same device. This mode is intended to be played on your local network. 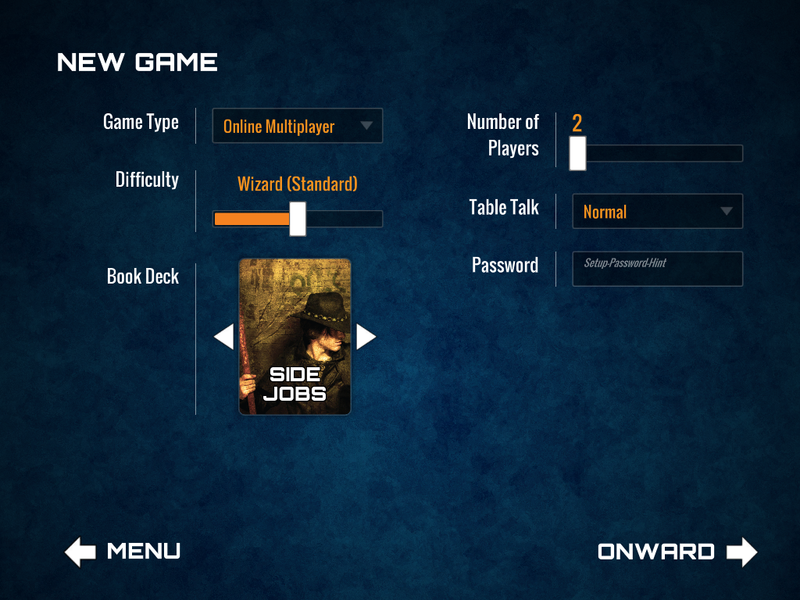 The "Table Talk" setting is so you can set the level of communication allowed with your other networked players. This mode is for playing on the Internet. There's a lot we're still fleshing out for that, right now. 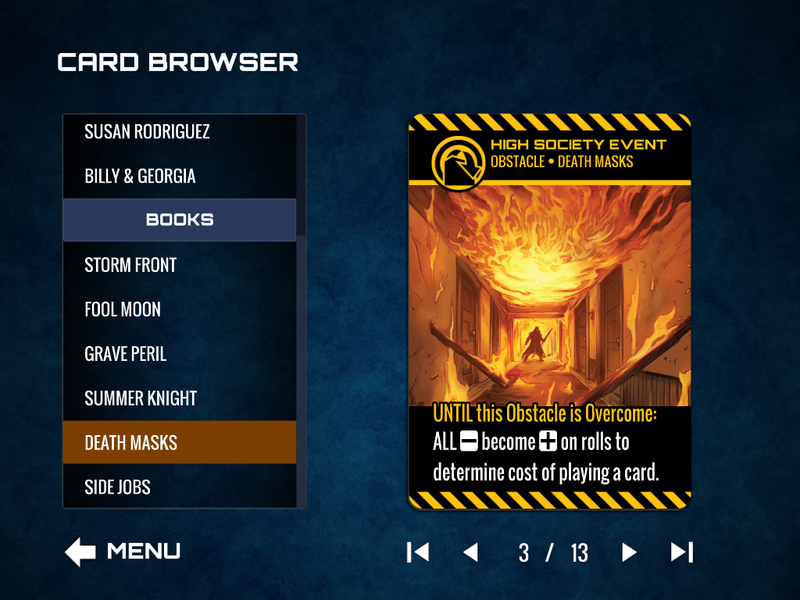 I've been doing most of my work on the Solitaire and Hotseat modes, so far. 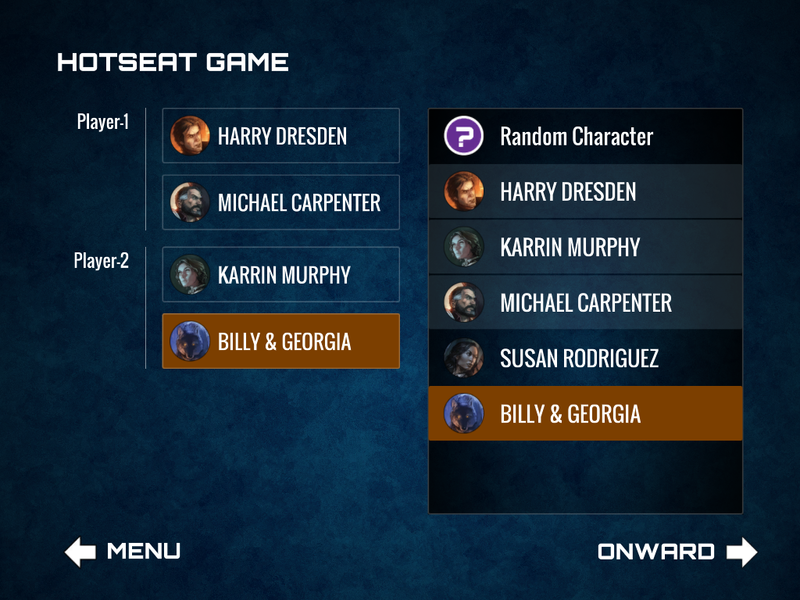 This is the screen for picking characters for Hotseat players. 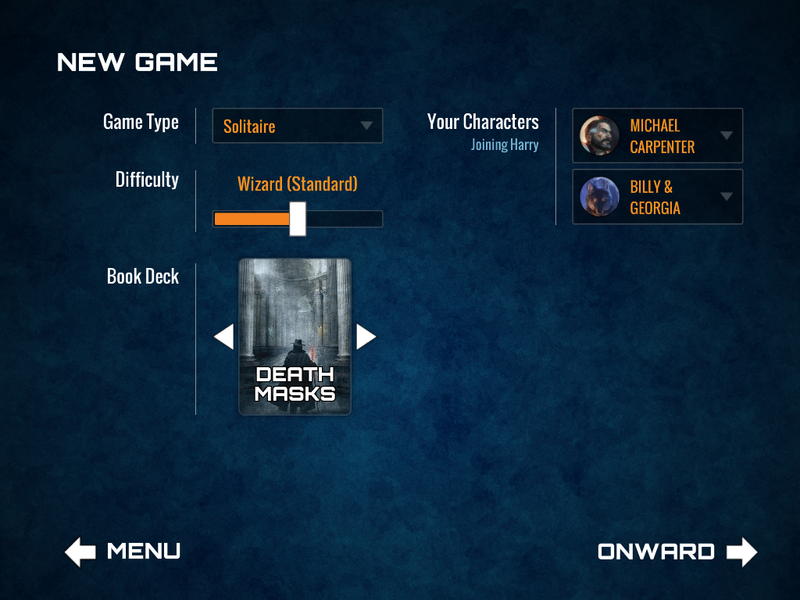 In this instance, we are using the special two-player rules, so each player gets two characters to play! The great thing about electronic games is that they can automagically apply rules for you, so you don't have to remember to do that! Harry always gets to pick who goes first at the start of the game! Here, you can see the simplified version of the cards that we've created, for use for high visibility on a wide variety of screens. 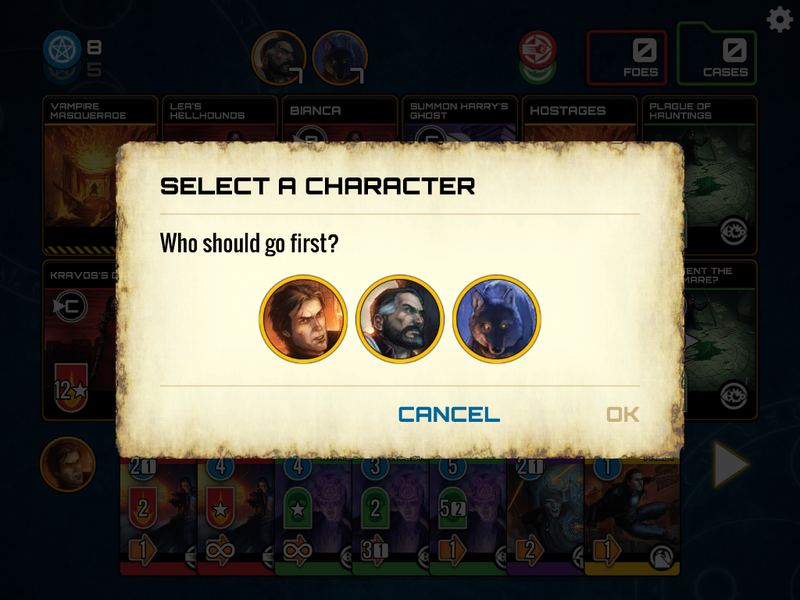 If you happen to have a big, beautiful, high-density screen, there will be a setting in the Options screen that will allow you to use the detailed cards all the time! 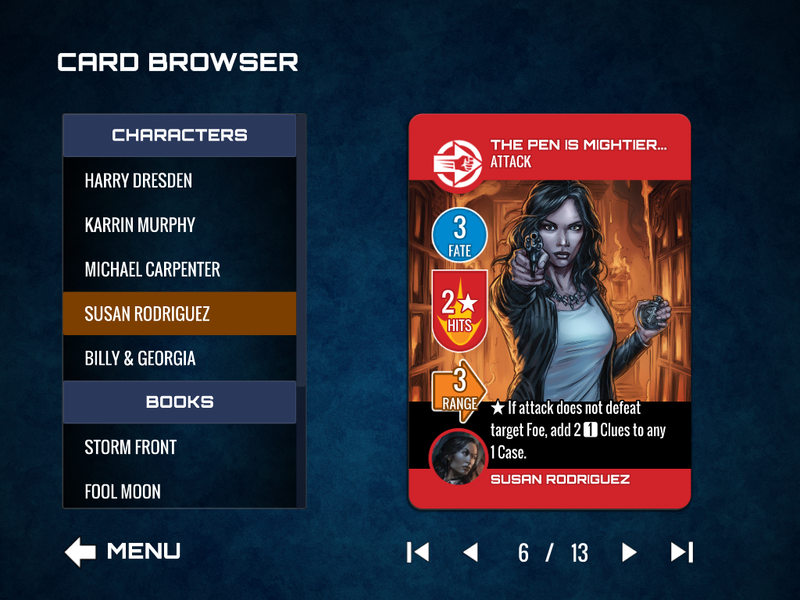 You can tap-and-hold, or use your mouse-wheel to zoom any card on the board. 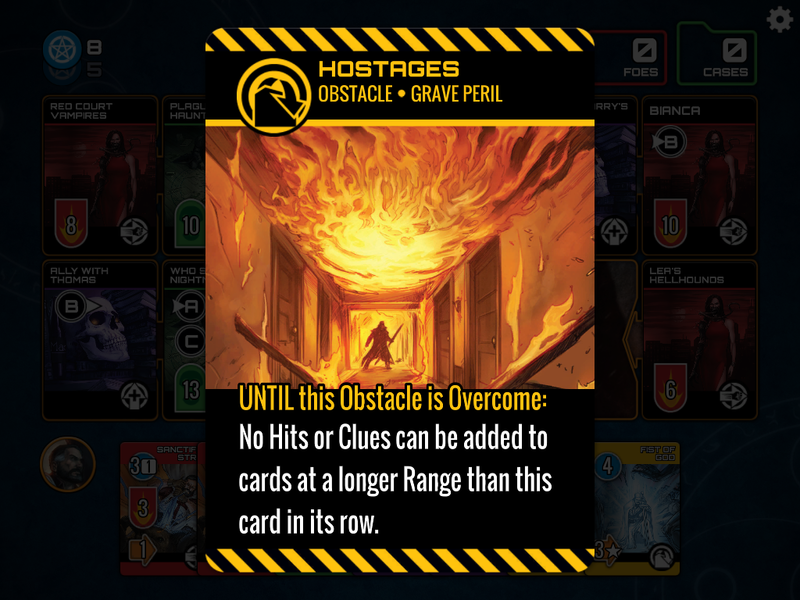 If your'e using the simplified cards, this will zoom into the detailed card, so you can read all the text clearly. Well, that's it for now, folks. If you have any questions, drop them on the Discussion board. Thanks!